The International Journal of Plant Chemistry, Plant Biochemistry and Molecular Biology. Phytochemistry is a leading international journal publishing studies of plant chemistry, biochemistry, molecular biology and genetics, structure and bioactivities of phytochemicals, including '-omics' and bioinformatics/computational biology approaches. Phytochemistry is a primary source for papers dealing with phytochemicals, especially reports concerning their biosynthesis, regulation, and biological properties both in planta and as bioactive principles. Articles are published online as soon as possible as Articles-in-Press and in 12 volumes per year. Occasional topic-focussed special issues are published composed of papers from invited authors. Full papers are original research papers reporting new discoveries that lead to a deeper understanding of any aspect of plants covered by the journal. Full papers are invited in the following sections, but these are not exclusive. Molecular Genetics and Genomics contains papers which demonstrate novelty and/or biological significance in relation to all aspects of gene structure and expression, and their role in plant function, regulation, comparative genomics, and reconstitution of biochemical pathways. This section may also contain studies of genetically modified plants that have been analysed for changes in their profiles of phytochemical production. Protein Biochemistry and Proteomics contains reports on plant proteins, including their purification directly from the organism or as a result of heterologous expression. This section includes studies of the macromolecular structure of proteins, protein function, enzyme mechanism, and proteomics, including in relation to changed genetics, environment or metabolism. Metabolism and Metabolomics contains papers reporting new discoveries in all aspects of plant metabolism, both primary and specialized (secondary). Contributions are encouraged that report the elucidation of metabolic pathways, metabolic regulation, or the biosynthesis and roles of macromolecules. Reports improving our understanding of how phytochemicals act in planta are particularly welcomed, as are studies of transgenic organisms or of metabolic variation. Ecological Biochemistry and Chemistry contains papers on how plants interact with their environment, including adaptation to environmental stress, symbiosis, interactions with other organisms, phytoalexins, phytotoxins, pollination (bio)chemistry, and the use of phytochemicals by other organisms. Chemistry and Bioactive Products contains papers on structural elucidation and in planta and in vitro activities of newly identified phytochemicals, including studies that elucidate their role and mode of action in nutritional, pharmacological, medical or therapeutic use. Studies of the biological activity of known compounds will only be considered when they add significant insight to the way in which the biological action of the phytochemical(s) is manifest. Chemotaxonomy contains papers on the comparative phytochemistry of plants, in particular their role as a taxonomic tool. Reviews are an authoritative and timely overview in a defined area and are intended to catch the interest of the general reader. A Review is a critical analysis of the current state of knowledge, pointing out strengths and weaknesses, weighing the significance of the studies conducted, how these fit into the more general subject area, and what are the key areas for further work. Authors should consult the Editor-in-Chief before preparing such articles. Molecules of Interest are short, focussed reviews (3-5 printed pages) of individual compounds or macromolecules that are currently attracting significant applied, commercial or biological interest. Authors should consult the Editor-in-Chief before preparing such articles. Viewpoints are articles that advance new ideas and conclusions concerning any area of plant biology and phytochemistry pertinent to the journal. Examples include the re-analysis of data using a new mathematical model, the reassessment of a pathway, or a new hypothesis to explain existing data. Authors should consult the Editor-in-Chief before preparing such articles. Examples include nomenclature issues, ways of expressing data, suggestions for standardising experimental procedures or any other topic that should stimulate debate. Further details of these categories are given in the Guide for Authors. Authors are advised to prepare their paper directly into the Phytochemistry format. Details of this are given in the Guide to Authors and can be seen in recently published papers. Submissions must be in good quality scientific English. Submission: papers must be submitted online at www.ees.elsevier.com/phytochem to the Editor-in-Chief. The Editor-in-Chief will designate an Associate Editor to handle the paper depending on the subject are in which the work reported was conducted. The author may propose a preferred Associate Editor in their cover letter. 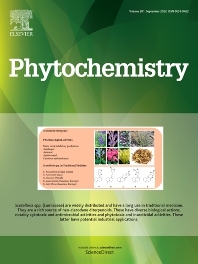 Phytochemistry is an official journal of The Phytochemical Society of Europe (PSE), The Phytochemical Society of North America (PSNA), and The Phytochemical Society of Asia (PSA). Society announcements are published at the discretion of the Publisher.